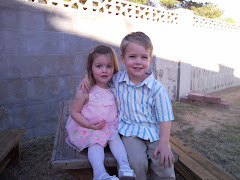 When Sadie was a new, needy infant, I remember thinking how hard it was to have 2 kids. Each time I had to put Dylan's needs off because the baby needed me more, I wondered how scarred he would be. I wondered how this new child would ever fit into the family routines that we had created around Dylan or what new routines would be created for the both of them together. It seemed as though he would never get a chance to appreciate what having a sibling would mean to him. Well, we have obviously made it through the trying "newbornness" of Sadie and it completely floors and amazes me to watch the two of them together today; to hear them laugh together with pure and genuine joy. Sadie is completely enamoured with her big brother and cannot take her eyes off of him. He is so proud that he can do silly little things to make her laugh out loud. It fills my heart to watch them play with each other and to hear Dylan say (in his two-year-old way), "I make Sadie happy. I so happy too!" Here are a few pics of the two happy siblings!